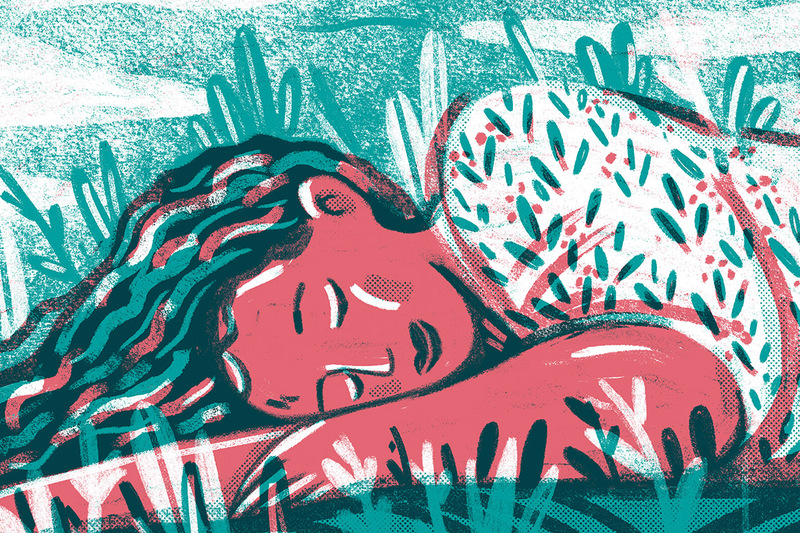 Drawing digitally allows for so much freedom to experiment and explore. There’s the almighty function of undo - enough said. 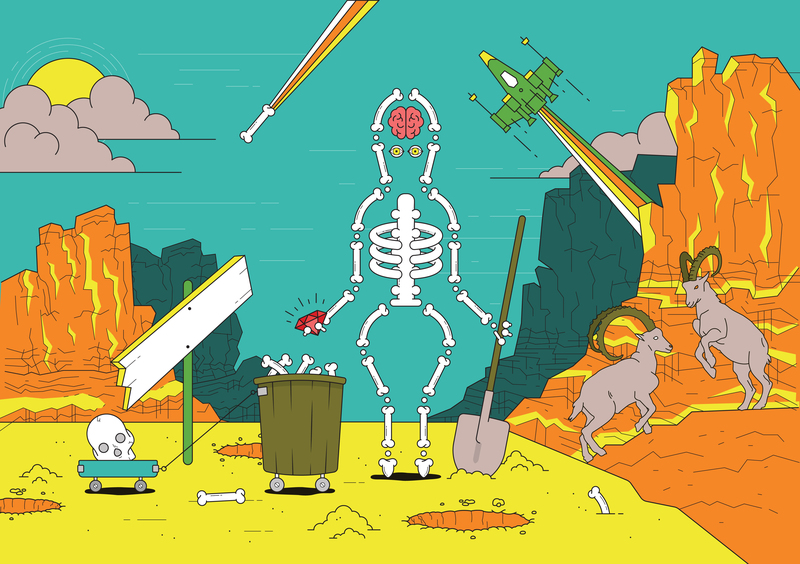 We’ve compiled this comprehensive guide for you to fully master the art of digital illustration. 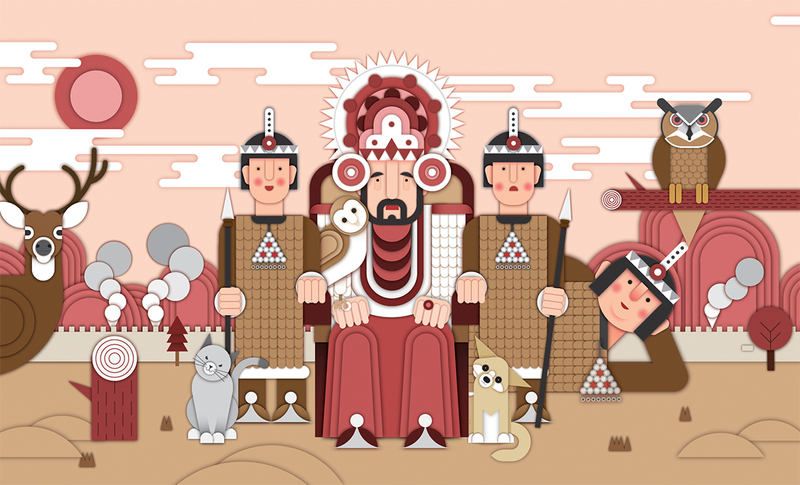 Digital illustration is first and foremost about creativity. Unlike Ikea furniture, there is no assembly instruction manual. But that does not mean you can’t enjoy a pool of knowledge to help you find your way around the digital artboards and canvases. There are tools, techniques, keyboard shortcuts, and methods to significantly speed up your workflow. For that reason, we’ve come up with a complete guide for digital illustration, focusing on Adobe Illustrator for vector illustration and Adobe Photoshop for pixel-based work (and how to bring the two together). Brought to you by two professional illustrators, this guide goes into each of the main techniques for both of these illustration styles, and explains in detail all of those tiny tricks that can make drawing a lot simpler for you. There are two things we love most about the Pen Tool. First, it only requires a mouse, so that you can create amazing digital illustrations with no drawing tablet. And second, it allows for acutely precise results, making it super useful for accurately tracing photographs or other resources. Drawing with the Pen Tool (P in your keyboard) is achieved by connecting several points, called anchors, that make up lines or paths. This results in an endless variety of lines and shapes, either geometric or curvy and arched, that can be created with nothing more than some (well-trained) clicks of the mouse. The anchors can be manipulated and moved around by dragging the handles attached to each one. 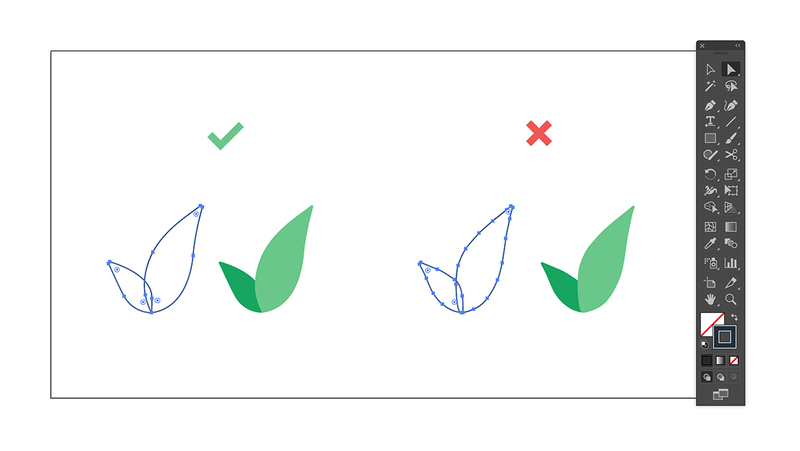 – Practice makes perfect: The Pen Tool requires some getting used to until you can fully master it. If the Pen Tool is new for you, take time to practice by tracing a photograph and strive to do this as accurately as you can. – Space your anchors wisely: Create your shapes and paths with as few anchors as possible. While using many anchors makes drawing easier, keep in mind that the more anchors you use, the bumpier the edges will be. – For straight lines, press Shift before positioning a new anchor. – In order to control the handles only (and not anchors), select the white mouse cursor (Direct Selection Tool, or A in your keyboard) and drag the handles while pressing down Alt. – Opposite handles are usually equal in length. If you want to control each handle individually and achieve different handle lengths, press Command or Ctrl while dragging the handle. – To delete handles, switch to the Anchor Point tool by pressing Shift + C.
There’s a special playfulness in taking the simplest of elements and turning them into complex artwork. 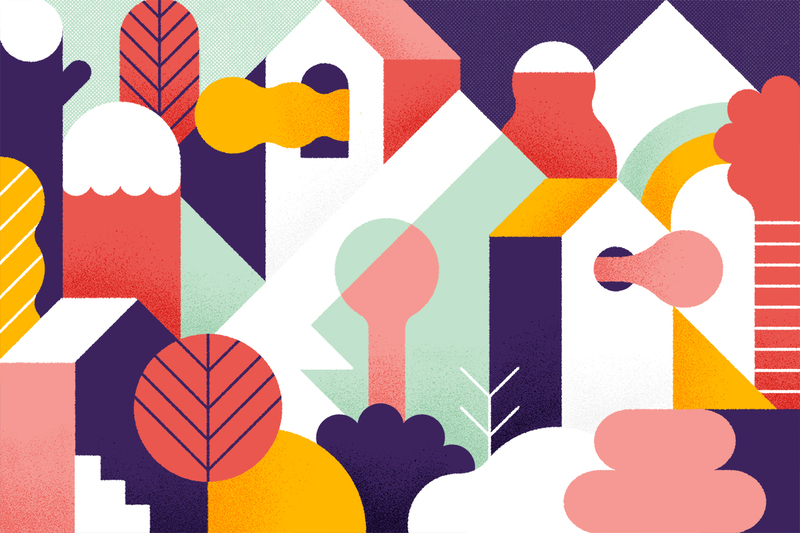 That’s what makes the geometric style of vector illustration so much fun. This style can make wonders out of basic geometric shapes such as circles and rectangles, sometimes cut and moved around in different ways, but always retaining their straight angles and perfect radiuses. This method works best with a combination of different tools that are used to cut and connect the different shapes together. The main ones that come in handy are the Pathfinder Tool (Window > Pathfinder, or Command or Ctrl + Shift + F9) and the Scissors Tool (C) and Pen Tool (P). 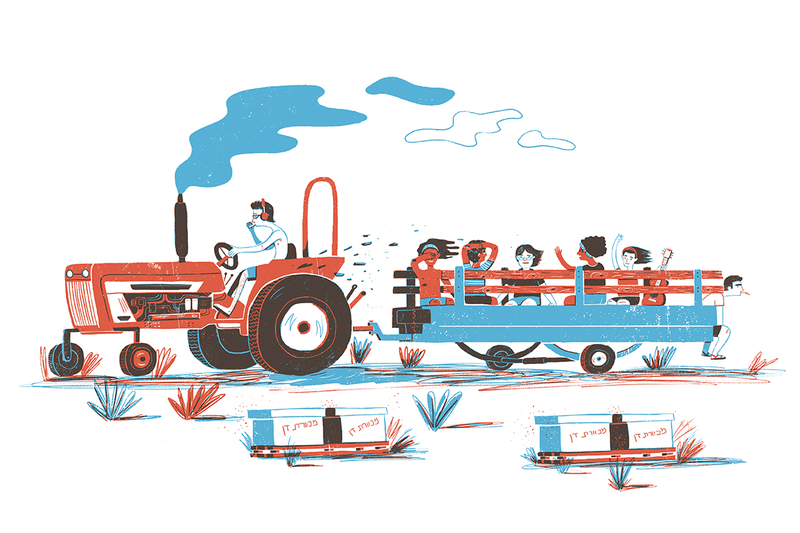 Uncle Max’s Journey, detail from a children’s book by Hanoch Levin, 2014, illustration by Ariel Wollek. This project was carried out under the supervision of Prof. Rutu Modan in the Visual Communication Department at Bezalel Academy of Arts and Design, Jerusalem. – Shapes are all around you: Everything can be broken down into basic geometry. To get your head around this concept, find a picture of your favorite animal and break it apart into its basic shapes, by placing shape outlines on top of the picture. Decide how you want to approach this: are the eyes just tiny circles, or are they ellipses with round pupils and a white flare of light? – Harmonize your art: When your image is simplified down to its bare geometrical necessities, visual harmony becomes even more crucial, so make sure your shapes are aligned with one another before merging them. It also helps to pick a few shapes and have them repeat throughout your illustration, to maintain a sense of consistency. – Think outside the box, circle, and triangle: Make your visuals interesting by rearranging the basic shapes we all know into new, unique and surprising ones. – Take the edge off your corners: Give your illustration a pleasant, curvy feel with the Round Corners Tool. While straight lines and perfect shapes are its main expertise, Illustrator can also be used for freehand illustration. Two helpful tips: By determining your line’s Fidelity (double-click on the brush or pencil icon for the Options panel), you can decide whether to keep your line as you drew it, or allow Illustrator to smoothen it out. Another thing to keep in mind is that you can clean excess lines from a freely drawn shape with the Shape Builder tool (Shift + M). Know that feeling of sorting through your pencil case and finding that perfect shade of marker, or that pen in the exact tip-width you need? The digital version of that would be the fun of playing around with Photoshop brushes. They provide neverending options for digital illustrations, sometimes very close in look and feel to real-life strokes, be it that of pencils, gouache, ink, or others. If you use these widgets the right way, you can achieve a highly realistic look – and pretty much any look you can dream of. There are so many great brushes out there, and this abundance can get overwhelming. It’s often wise to find the ones you like best and fit your style, and stick to those. Using a limited amount of brushes can also help in creating a unified look throughout your works and portfolio. And just like any other piece of equipment, no matter how sophisticated your tools are, there are no magic brushes. Nothing replaces hard work and a good composition. Adobe Photoshop comes with a basic set of brushes that are sufficient for most uses. If you’re looking to expand your options, explore some of the professional brush sets that you can purchase online or download for free – there are so many good ones. And if you have the CC18 version of Photoshop, you can also enjoy the recently released set of brushes by illustrator Kyle T. Webster, offering over 1,000 high-quality brushes. Grandfather Stories from Addis Ababa, a spread from Or Yogev’s graduation project, 2016. This project was carried out under the supervision of Alon Briar, in the Visual Communication Department at Bezalel Academy of Arts and Design, Jerusalem. – Own your stroke: For most techniques, it’s best to draw and erase with the same style of stroke, to achieve unified shapes and lines. One way of doing this is by setting both the Brush Tool (B in your keyboard) and the Eraser Tool (E) as the same brush. A different way is to create your image on a layer mask, drawing with a white brush and erasing with a black brush (interchange between the two by hitting X) – this way it’s easy to make sure that you’re always using the same style of stroke. – Put a spin on it: Use the Rotate Tool (R) to see your image from different angles. You can always reset the view back to its upright position with a quick hit on the escape key. – Smooth it out: The latest update of Photoshop includes a new control for brush stroke smoothing in the options bar. Increasing the value of smoothing reduces jittering and helps in creating smooth, curvy shapes. This is especially useful for digital lettering. – Beware of heavy brushes: Some brushes you download to Photoshop might by too heavy and slow down the program. Better avoid these to keep your workflow going. – Color by locking the pixels: Click the ‘lock transparent pixels’ button in the Layers panel (the one that looks like a checkered box). This should lock down all active pixels in the layer so that when we paint over them, all existing pixels will change color – but no new pixels will be added. Don’t forget to unlock the layer when you’re done! – Color with a clipping mask: To do this, create a new layer. In the Layers panel, click on the thin line between the two layers while holding down Alt. This will result in a small arrow linking the new layer to the one below it, so whatever color you paint with on the clipping mask will automatically apply to the content of your previous layer. Textures are a digital illustrator’s best friend. They add depth to your 2D pieces, and create a more convincing and authentic feel. But when overused, textures can become too dominant, obstructing the illustration with an overly-grainy blur. Use your textures wisely and pick your favorite ones to work with, to maintain a unified look. In order to import textures into Photoshop, go to Layer > New fill layer > Pattern, or click on the ‘Create new fill or adjustment layer’ icon (the black and white circle) at the bottom of the Layers panel. This way, each new texture will come with a mask, which helps in applying your texture only to relevant areas. – DIY your textures: You can scan real-life visuals and use them as textures on Photoshop. Create interesting textures manually with watercolors, acrylics, ink, or even plain paper, and easily import them into Photoshop. There are also a lot of great textures available for download online. – Color your textures: To color your texture, use a clipping mask [Reminder: create a new layer. In the Layers panel, click on the thin line between the two layers while holding down Alt. This will result in a small arrow linking the new layer link to the one below it, so whatever color you apply to it will fill the visuals in your previous layer]. Of all the different old school paint-and-paper techniques, screen printing is one that has only been on the rise in recent years. Screen printing is based on printing in layers, one layer for each color – which makes it a perfect fit for the layer-based Photoshop. The unique screen printing look is achieved when the different colors show through their corresponding layers, creating new colors as a result. For that reason, we recommend limiting your color palette to two to three colors – confining each color to a separate layer – which will total in three to six different colors when mixed. The best way to create this effect is by using the Photoshop blending modes – ‘Multiply’ is a great option, and ‘Linear Burn’ is also good if you’re looking for extra contrast. Pro tip: It’s sometimes easier to apply blending modes on a group of layers instead of a single one. This makes playing around with the layers slightly more convenient. Digital illustration does not necessarily mean you abandon the pen and paper all together. With these techniques, you can have the best of both worlds – enjoy the special handmade appeal as well as the tech benefits of computer programs. If you want to bring your sketchbook artwork into Photoshop, it’s best to create your linework and shading separately. Draw the lines first, making sure to work in high contrast black-and-white so that it will be easily read on your computer – preferably with a black pen or marker, but a pencil can also work. Scan the image or take a high-resolution photo of it, retaining the high contrast. – Select the whole image (Command or Ctrl + A) and copy it. – In the ‘Channels’ window, create a new channel which will show up as black. – Paste the image into the new channel and invert it (Command or Ctrl + I) so that the image becomes white. – Press ‘Load channel as selection’ (the dotted-circle icon at the bottom of the Channels window), so that only your image is selected. – Back in the Layers panel, open a new layer. – Press Command or Ctrl + backspace, which will color in your selected area. Your line work is now digitized! You can create an additional handmade layer for the same illustration – the shading layer. Do this on a separate piece of paper, using tracing paper or a light table. Repeat the previous steps for scanning and separating the image from its background. Now your Photoshop file should have one layer of linework and one layer of shading, both created by hand – and this is where the digital fun comes in! 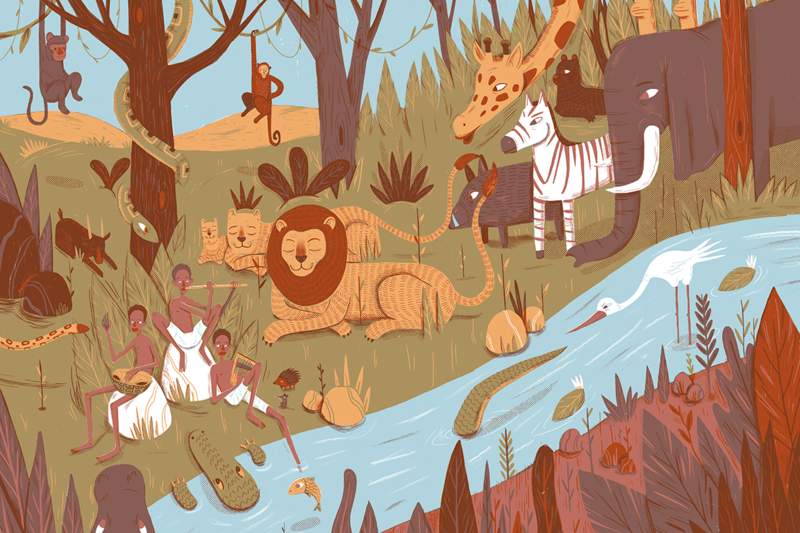 Add color, textures and other elements, enriching your illustration to your heart’s content. Vector and pixel-based illustration each have their pros and cons. But bringing the two together only means double the fun. Many illustrators who create their images on Illustrator first, later go to Photoshop for their textures and finishing touches. – Once you’re happy with your Illustrator file, select everything on your artboard and copy it. – Go to Photoshop and make sure none of the layers are selected. Once you paste your visuals you will see a pop-up window. Select ‘Paste as: Path’. – Open the Photoshop Paths window. Your visuals should all be there as a new Work Path, not yet separated into layers. – This next step takes time but bare with us, it will definitely pay off. Using the black arrow cursor (A), select each shape individually. For each shape selected, open a new layer in the Layers panel. Then back in the Path panel, click ‘Fill path with foreground color’ and ‘Stroke path with brush’ (the black circle and outlined circle icons at the bottom left of the panel). You can then delete the cyan outline of the shape, or decide to keep it in case you’d like to modify it later on. This should result in each of your shapes on a separate layer, colored in and ready to use!